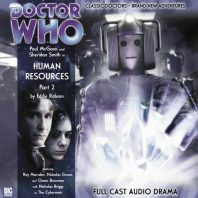 Following a superb opening half to the first season finale of The Eighth Doctor Adventures in which ‘Human Resources Part 1’ used the dichotomy between the mundane and the fantastic to create a bombastic entry for the Cybermen as the Headhunter finally managed to bring Lucie Miller to Hulbert Logistics, ‘Human Resources Part 2’ is laden with an altogether more monumental task besides simply telling a thrilling Cybermen tale- explaining Lucie’s history and just why the Time Lords were so keen to intervene in her affairs in the first place. Fortunately, regarding Lucie herself, ‘Human Resources Part 2’ manages to hit all of the right notes with its explanations. Bringing Gallifrey squarely into the equation by discussing the mistrust and deceit between the High Council and the Celestial Intervention Agency shows just how important this operation and Lucie are to all involved and manages to highlight just how much of an unknown quantity the Time Lords and- by extension- the Doctor are to the universe at large. At the same time, while the quantum crystallizer literally skews the odds of battle so that the Cybermen never have a chance of victory, the story shows just how far the Time Lords are willing to go to prevent Lucie from coming in contact with the device as well as their desire to keep Lucie from fulfilling her destiny and becoming a right-wing tyrannical dictator by literally altering the events of her life. This revelation results in Sheridan Smith giving perhaps her most reflective and poignant performance as Lucie yet while also initially forming the crux for an incredibly complex and potentially dangerous arc going forward. Unfortunately, discovering that the Time Lords have made a mistake and not taken Karen who interviewed for the same job at the same time as Lucie and who is in actuality the one destined to become the dictator leaves this portion of the Lucie arc somewhat unsatisfyingly resolved and consequently open-ended with a new trajectory as Katarina Olsson’s Headhunter and Louise Fullerton’s Karen escape together at the end of these events. As much as Lucie becomes the focal point of this story, however, nothing should be taken away from Paul McGann’s performance in what is easily the Doctor’s standout story of this opening season as he deftly confronts challenges and challengers alike from all sides with remarkable aplomb. The supporting cast is once again extraordinarily strong, with Roy Marsden’s Hulbert and Nicholas Briggs’s Cybermen both successfully vying for position as the most dangerous entity involved. Although there is not any of the traditional body horror relating to the Cybermen conversion process here, it’s nonetheless intriguing to note that Hulbert has selected the method of brainwashing humans into becoming mindless automatons to run his enterprise. The similarities between these two forces are never really mentioned, but it does add an extra level to the battle at hand. As a result, then, ‘Human Resources Part 2’ is an incredibly entertaining and streamlined production that manages to satisfyingly answer the lingering questions while teasing new ones going forward. With strong performances, sound design, and direction, it’s only the crushing fact that Lucie’s involvement in the Doctor’s life is a mistake that keeps this story from achieving perfection, though the narrative thread set in motion still has plenty of time to pay off in the future.